Snow’s Darrian Nebeker crashes the boards during the Badgers’ game against Salt Lake Community College last Saturday. The Badgers bombed the Bruins 108-88. EPHRAIM—The Badgers had a real “Jekyll and Hyde” kind of week last week. On Thursday, Snow’s men’s basketball team played the College of Southern Idaho, and for a while in the first half, the Badgers just could not buy a bucket. They wound up losing to CSI 91-71. And then on Saturday, it seemed for a while they just could not miss. 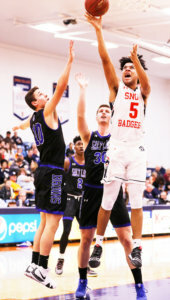 After the first half against the Salt Lake Community College Bruins, the Badgers had blasted the visitors nearly out of the gym, leading 55-27. The Badgers shot 60 percent from the field, 55 percent from 3-point land, and held the Bruins to only 24 percent. The final score of 108-88 did not reflect just how dominating a performance it was, as the Badgers let their foot off the gas late in the second half and played many bench players. After their second game against CSI this season, the Badgers have to think they are snake bit against that team. In the first game, the Badgers shot nearly as well as the Golden Eagles, but CSI had nearly twice as many foul shots as the Badgers. This time, when the Badgers traveled to Twin Falls, the rim seems smaller for the Badgers than for the Golden Eagles. The Badgers hit their first 3-pointer to take a 3-0 lead. And then CSI reeled off 15 straight. By the end of the first half, Snow was only shooting 25 percent from the field, and was trailing 43-28. And it wasn’t as if the Badgers were taking bad shots, they just weren’t falling at all. The Badgers fought back and cut the lead to only 7 in the second half, but could not sustain their momentum and eventually lost 91-71. On Saturday, against a team that has given Snow fits for many years, the Badgers came out firing on all cylinders and quickly jumped on top of the Bruins. At first, it seemed the game would play out as many previous games had done, tight and back-and-forth. But then Jake Walker started to hit 3-point shot after 3-point shot. Seemingly inspired, Logan Hokanson started shooting 3s too. And then Brantzen Blackner joined in. By the end of the first half, Walker had 9 points on 3-6 shooting from 3, Hokanson had 12 points with 2-4 from behind the arc, and Blackern was a perfect 3-3 with 10 points. By the end of the game, Blackner led all scorers with 21 points, only missing once all night at 7-8. Hokanson was close behind with 20 points, on 7-10 from the field, and also passing out 7 assists, collecting 7 rebounds, getting 2 blocks, and he’s probably looking for a partridge in a pear tree somewhere. Hokanson’s efforts were good enough to get him named Scenic West Athletic Conference Player of the Week, for the second time this season. The win moves Snow into sole possession of second place in the SWAC at 4-2, a half-game behind USU-E. The Badgers play USU-E on Saturday at the Horne Activity Center, tip-off to start at 5 p.m.